Jonathan Meres will be known to his legions of young readers as the man behind The World of Norm series. The first book in the series The World of Norm: May Contain Nuts has recently been shortlisted for the Red House Children’s Book Award and Jonathan is busy writing the fourth book in the series, which will be published next year. Jonathan is a former stand up comedian and Perrier Award nominee. What was your reaction when you found out that you’d been nominated for the Red House Children’s Book Award? Thank you very much. And you’re most welcome. Thanks for agreeing to ask them. They’re very nice questions. What was my reaction to being nominated? How much is the prize money? As my old mum used to say – it’s not the being nominated that’s important. It’s the winning that’s important. Will you be attending the awards ceremony in London? Definitely. I don’t get out much. Apart from The World of Norm, which of the shortlisted books would get your vote if you were a child? The one about the….oh, you know? The one where that thing happens? It’s got words in it? That one. Can we look forward to any more Norm books or are you working on other books? I understand that you’re Patron of ‘Books Abroad’, a Scottish-based charity which donates books to schools in developing countries. Why did you become involved with this charity? Short answer = because I was asked. Longer answer = I was aware of Books Abroad anyway and a big admirer of what they do. So when I was asked I didn’t even have to think about it. They’re based in an industrial unit in a tiny village in Aberdeenshire. I went to visit and saw pallets of books being loaded into a container bound for Ghana. Totally awe-inspiring. If I ask you nicely, might you bung their web site address up somewhere please? Check them out people. And especially teachers about to clear out text books! As an Edinburgh resident, can you let us in on some of your favourite places in the city? Do you have any favourite bookshops? My giddy aunt. Too many favourite places to mention! Does that even make sense? Can you have more than one favourite? So in no particular order: Portobello prom, Holyrood Park (inc Arthur’s Seat), The Union Canal, Cramond, The Gallery Of Modern Art, The Water Of Leith, Fopp Records. That enough? Favourite bookshops? All bookshops are lovely. Even rubbish bookshops are lovely. You seem to visit lots of schools and libraries. What have been some of your most memorable moments when you’ve met young fans of your books? Well I had the best question ever the other week in Perth. ‘How many jobs haven’t you had?’ So what we did was we worked out how many jobs I had had. We reckoned it was 6. I then asked how many jobs they reckoned there were altogether in the world? We reckoned 100. So it was a case of simple arithmetic. 100-6 = 94. Have you written your Christmas list yet? Which book would you like to find in your stocking this Christmas? No I haven’t. Not yet. I have a ridiculously wide taste when it comes to books – and most things for that matter. So I tend not to only read one or two genres. At the moment, for instance, I’m reading an autobiography of a musician. The one before that was a ghost story. The one before that was a crime novel. Actually if Santa’s reading this I’d really like the autobiography of the former Australian test cricket captain, Steve Waugh. How do you think Norm would be spending Christmas this year? Being wound up by his brothers. Doing anything to avoid spending time with his perfect cousins. Riding his bike. 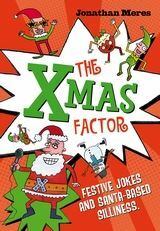 But mainly reading The Xmas Factor – a stocking thriller stuffed to bursting point with rollicking rhymes, sproutastic jokes, top tips and seasonal silliness – published by A & C Black and available at all good bookshops. And all rubbish ones too. To find out more about Books Abroad, please click here. If you know a child who’d like to vote for the Red House Children’s Book Award, please click here.